Quentin passed away on December 28, 2008. His contact with all of you and the information he was sharing here meant a great deal to him, so we will continue to maintain his web site for a very long time. Quentin was laid to rest in Arlington National Cemetery Friday, 2/27/09, to full honors and an Air Force flyover of four A-10 Thunderbolt II jets. Washington's ch. 5 WTTG covered it on that night's news and Sunday 3/1, the Fox News Channel had a short piece on it. Photos from the ceremony at Arlington National Cemetery can be found at the following site. Update: On 1/11/18, Quentin's beloved wife, Jackie, passed away. She is now buried with Quentin at Arlington National Cemetery. They are together once again. Photo taken at Thunderbird Field, Phoenix, AZ, during Primary flight training. This web site is dedicated to preserving some of the personal history of World War 2. Some of my own experiences that do not appear in my film, A Fighter Pilot's Story, will be told here, as well as stories of other fighter pilots of World War 2. We hope you will find this site to be of interest, and that you will share it with your friends. We encourage you to visit our sub sites as well. Just click on the links to these sites at the bottom of this page. I guess in one sense you can say we are an endangered species. But unlike the spotted owl or the whooping crane, there is no legislation that can be enacted to save us. We are rapidly disappearing off the radar screen, and soon all that will be left is what we have written, what we have recorded, and some old, fading photographs. Our voices will be forever silent, and the untold "first-hand accounts" of our experiences will remain untold. We are the boys of World War II. We are dying off at the rate of 1,500 a day -- that's 45,000 a month. That number will steadily increase until the unyielding laws of mathematics give us an increasing rate of deaths, but a decreasing number of deaths -- the remaining pool will have become too small. Taps is just one sunset away. But in our lifetimes, we made a difference. We had the good fortune to live during a time when honor, patriotism, and character were important. We stepped up to defend freedom, and put our lives on the line for the "cause." It was a moment in history that may never occur again. "It was 1944. I was 22 years old. And I was a combat fighter pilot in World War II. Along with thousands of other young Americans, I had been trained to be an efficient killer, and the deadly skies over Europe were my battlefields. The events of those violent and bloody days are difficult to comprehend, or even imagine. The story you are about to see is the result of the urgings of my children. They have wanted to know -- in specific terms -- what my life was really like during those critical years....those were the years I left college and joined the Air Corps, and met the girl I later married. Those were the years this airplane, the P-47 Thunderbolt, was to be my main weapon of destruction. It has been a traumatic experience for me to go back through all this. But perhaps, in other ways, it has helped purge some of the devastating memories that have haunted me for almost 50 years. So this is my story. It is being told so the children and grandchildren of those who were involved in this mortal storm, can have a better understanding of what our world of war was really like." Those words above provide the opening to my personal war experiences, as told in my video and television program, A Fighter Pilot's Story. This was a story I had written, narrated and produced for my family. It also attracted the attention of national PBS, and was first broadcast in June 1994 on more than 300 PBS stations across the United States. It was repeated in 1995 and 1997. It is estimated that more than 30 million people have seen this program. World War II was the defining moment of the 20th Century. For millions of young American men, it had an impact on them that would forever be a part of their lives. Their personal experiences defy description -- the trauma and tragedy they experienced would be theirs alone to endure. I have posted below, and on following pages, some of my war experiences that were not included in the television program, as well as stories relating to other fighter pilots in World War II. During our first two or three weeks after landing in Normandy, a terribly disturbing and distressful situation was taking place below the cliffs of Pointe du Hoc. Bodies of decomposing American soldiers who had been killed during the invasion continued to wash up on shore. We could look down from the bluffs overlooking the English Channel and see them. For the pilots who faced death on every mission, this was particularly upsetting. Some of us had trouble getting this gruesome picture out of our minds, especially when we were lying in our cots at night trying to go to sleep. We could visualize those bodies just a few hundred yards away rolling in the surf. The graves registration people had moved on by that time -- up closer to the front -- so there was no one we could call on to retrieve the bodies. One evening our Engineering Officer -- a solid, no-nonsense guy -- decided something had to be done. He asked several guys to help him, including some of the pilots. We carried 5-gallon jerricans filled with aviation gasoline -- and several long poles with hooks attached to the ends -- down the hill to the beach -- then we carried everything to the area where the bodies were piling up. The mood was somber; there seemed to be a sense of unreality about what we were going to do. It was a terrible, gruesome ordeal. Most of the bodies were badly decomposed and bloated, but some looked surprisingly normal. We hooked the bodies with the long poles, and pulled them together and piled them up as much as possible. We added as much driftwood to the pile as we could find. In a couple of instances we were able to get their dog tags for identification purposes, but for most of them, there was no way we could make any identification. Then we soaked the whole pile heavily with aviation gasoline. The engineering officer had us back away, then he paused by the bodies for a minute as if in prayer, finally he ignited the pile. It burned furiously for a short time, then more slowly as the gasoline burned off. The driftwood kept the fire going for some time. As I watched the fire consume the rotting bodies of these young American boys, I couldn't help but think about their families -- and how it would drive them insane if they knew what really had happened to their sons. Better that they should picture their boys being instantly killed by a rifle bullet -- and then being given a proper military funeral -- with a bugler playing "Taps" over the grave. But deaths in battle seldom involve dignity. They are horrible, brutal, degrading, and the fact that they died for a good cause cannot sanitize the reality of the circumstances of their deaths. We slowly drifted away from this horrible scene, but I am sure all of us who were there still carry vivid images of it in our minds. A few days later I again followed the mine-cleared path to the edge of the bluff and looked down to the water’s edge, only to see that our traumatizing experience had been for naught. More bodies were rolling in the surf, as the English Channel continued to give up its dead of D-Day. This was the first of several intense periods of war we had throughout the last six months of 1944 and the end of the war in Europe in May 1945. For the pilots of the 366th Fighter Group, it was an especially brutal time. We had moved from England to Normandy on D+12 about a month earlier, and living conditions were still rather spartan. Our food primarily consisted of K-rations with an occasional pot of dehydrated stew. But at least we were now under cover with about six men to a pyramidal tent, sleeping on standard army canvas cots. We even had a jerry-rigged shower made by mounting two wing tanks on a wooden stand. But Allied forces were stalled in Normandy. The Germans had pinned us into the hedgerow country, and daily Allied gains on the ground were measured in hundreds of yards, if any. Right behind our tent area in an apple orchard was an American 90mm anti-aircraft battery, and almost every night a couple of German planes would fly over. These 90mm guns and a thousand others spread across Normandy would open fire, and the sky would be filled with tracers and falling shrapnel. Uninterrupted sleep was uncommon. July 15, 1944: Dive bombed the railroad bridge on the Seine River at Rouen, France. Halfway through the 60 degree dive from 8,000 feet, I took a direct hit in my right wing from a 40mm flak shell, leaving a large hole completely through the wing. I am sure I was praying as I pulled out of that dive, expecting the wing to collapse any second. If it had, I would have had no chance to bail out -- the G-forces would have pinned me in the cockpit. Thirty minutes later I was safely on the ground at our airstrip in Normandy. July 17, 1944: Coutances, France. Dive bombed bridge. ME-109s and FW-190s attacked us in our dive. Our top cover flight of four P-47s engaged them. July 24, 1944: Attacked along front lines. Dive bombed and strafed German troop concentrations. Heavy flak. July 27, 1944: Morning mission, armed reconnaissance. We destroyed two tanks and several trucks. My element leader, 2nd Lt. Paul Bade, was killed within 40 feet of me. July 27, 1944: Afternoon mission, armed reconnaissance along front lines. Strafed anything that moved behind German front lines. Intense flak. Battle damage. July 29, 1944: Gavrey, France. Dive bombed bridge and tanks. Intense flak. My bombs hung up, so I had to carry them back and land with them still attached to my wings. Fuel warning light had been on for 20 minutes. Because of weight of the bombs I had to land at high speed. Plane in front of me was slow in clearing the runway. He had not heard my repeated calls, "I'm landing hot. Clear the runway." I overran him near end of the runway. This photograph of the plane that didn't clear the runway shows that two pilots were very lucky that day. August 1, 1944: Tours, France. Armed reconnaissance. Strafed train and vehicles. Hit by flak. All pilots very tired from stress of continuing combat. August 3, 1944: Scrambled in a hurry to dive bomb German tanks counter-attacking near Mortain. Over Vire I took several 20mm flak hits. Fire in the cockpit and supercharger. Tried to bail out but canopy was jammed from flak hit. Crash landed at our base. Knocked unconscious, dislocated shoulder in crash landing. After this mission I was given several days leave in London to recover. I was back flying missions on August 10, 1944. (Note: current x-rays still show damage to shoulder and three ribs broken by shoulder harness). 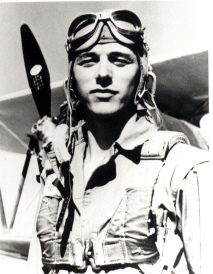 July 24: Captain Vernon Taylor shot down by flak. July 26: 1st Lt. Robert Ackerly. Hit by flak. Bailed out -- plane was on fire. July 26: 1st Lt. John Englehart. Hit by flak. Bailed out. July 27: 1st Lt. Charles Ray. Strafing with bombs on. Hit by flak --- crashed and burned. KIA. July 27: Capt. Jack Engman. Hit by flak. Plane was on fire. Bailed out at 8,000 feet, but chute did not open. KIA. July 27: 2nd Lt. Paul Bade. Hit by flak at low altitude. Tried to bail out, but was too low. KIA. Waved to wingman an instant before he crashed. I was that wingman. July 28: 2nd Lt. Robert Jones. Shot down by flak. Injured in bailout. July 28: 2nd Lt. Clinton Mendenhall. Hit by flak in his dive. Crashed in flames. KIA. August 2: 1st Lt. Kenneth Roberts. Hit by flak over Vire. Crashed on edge of town. KIA. It was late August 1944, and Patton’s Armored Divisions were in a mad dash to the Seine River, trying to catch the rapidly retreating Germans before they could escape. I was flying in a flight of four Thunderbolts patrolling the Seine to do everything we could to prevent their crossing. Up to this time most of the Germans had been crossing at night to escape our attacks, but on this particular day – with Patton’s tanks rapidly approaching them – the Germans were forced into trying to cross during the daytime. It was late afternoon near the town of les Andelys when we suddenly spotted them. What happened during the next 10 minutes will stay fixed in my memory as long as I live. The German troops were crowded on barges, in small boats, just anything that would float. We caught the barges in midstream, and the killing began. I was the third plane in the attack, and when I pulled in on the target a terrible sight met my eyes. Men were desperately trying to get off the barges into the water, where large numbers of men were already fighting to make it to shore. My eight .50 caliber machine guns fired a hundred rounds a second into this hell. 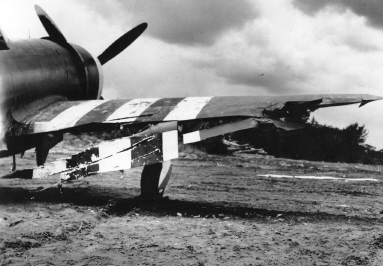 As the last P-47 pulled off the target, the first plane was making its second strafing pass, and the deadly process continued. In about three passes we had used up our ammunition, so we pulled up and circled this cauldron of death. I don’t know how many men we killed that day, but the numbers had to be very high. 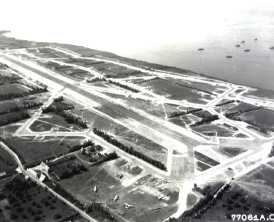 All of the pilots were quiet as we flew back to our base in Normandy – there was no radio chatter. We each shared the agony of what we had just done. We were traumatized, but there had been no other option. If we had let them go, we knew that they would be killing American boys in a couple of days. In my nightmares I still vividly picture that scene. After more than 50 years, it still haunts me. I deal with it, but think for a moment what it must be like to have to deal with it. There is no glamour in war. You kill people – and you see your friends die. The only honor involved is what you yourself bring to the process. You try to do the job you know you must do – and you try desperately to keep your sanity. But you are forever changed. You are no longer young; in a matter of months you have aged years. Though you have physically survived, you have lost more than life itself; you have lost part of your soul. 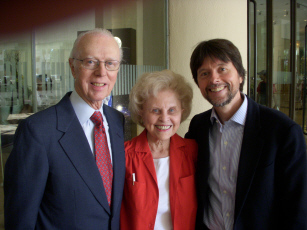 Ken Burns, the outstanding documentary filmmaker, broadcast his great epic documentary, entitled The War, on PBS beginning September 23, 2007. I was honored to be involved in many episodes of this show. For highlights of the world premiere of The War, click here. For information about Quentin's personal documentary, "A Fighter Pilot's Story," you can email Quentin's daughter at his boldtiger address. Artist William R.Farrell of New York City has created an impressive painting of Captain Quentin Aanenson standing with his P-47 Thunderbolt airplane. This painting, the Thunderbolt Patriot, pays tribute to those pilots who served their country in time of war. A photo of this painting and information about it can be found by clicking here. Additional stories and photos of my personal war experience. Click on the following links to view the pages. A marvelous source of information and links to other interesting WWII sites! Feel free to email Quentin's daughter at his boldtiger address.